Global distribution of kelp that locally form forests. "I can only compare these great aquatic forests...with the terrestrial ones in the intertropical regions. Yet if in any country a forest was destroyed, I do not believe so nearly so many species of animals would perish as would here, from the destruction of kelp. Amidst the leaves of this plant numerous species of fish live, which nowhere else could find food or shelter; with their destruction the many cormorants and other fishing birds, the otters, seals and porpoise, would soon perish also; and lastly, the Fuegian[s]...would...decrease in numbers and perhaps cease to exist. Physically formed by brown macroalgae, kelp forests provide a unique, three-dimensional habitat for marine organisms and are a source for understanding many ecological processes. Over the last century, they have been the focus of extensive research, particularly in trophic ecology, and continue to provoke important ideas that are relevant beyond this unique ecosystem. For example, kelp forests can influence coastal oceanographic patterns and provide many ecosystem services. However, the influence of humans has often contributed to kelp forest degradation. Of particular concern are the effects of overfishing nearshore ecosystems, which can release herbivores from their normal population regulation and result in the overgrazing of kelp and other algae. This can rapidly result in transitions to barren landscapes where relatively few species persist. The implementation of marine protected areas is one management strategy useful for addressing such issues, since it may limit the impacts of fishing and buffer the ecosystem from additive effects of other environmental stressors. The term kelp refers to marine algae belonging to the order Laminariales (phylum: Heterokontophyta). Though not considered a taxonomically diverse order, kelps are highly diverse structurally and functionally. The most widely recognized species are the giant kelps (Macrocystis spp. ), although numerous other genera such as Laminaria, Ecklonia, Lessonia, Alaria, and Eisenia are described. A wide range of sea life uses kelp forests for protection or food, including fish. In the North Pacific kelp forests, particularly rockfish, and many invertebrates, such as amphipods, shrimp, marine snails, bristle worms, and brittle stars. Many marine mammals and birds are also found, including seals, sea lions, whales, sea otters, gulls, terns, snowy egrets, great blue herons, and cormorants, as well as some shore birds. The holdfast is a root-like mass that anchors the thallus to the sea floor, though unlike true roots it is not responsible for absorbing and delivering nutrients to the rest of the thallus. The stipe is analogous to a plant stalk, extending vertically from the holdfast and providing a support framework for other morphological features. The environmental factors necessary for kelp to survive include hard substrate (usually rock or sand), high nutrients (e.g., nitrogen, phosphorus), and light (minimum annual irradiance dose > 50 E m−2). Especially productive kelp forests tend to be associated with areas of significant oceanographic upwelling, a process that delivers cool, nutrient-rich water from depth to the ocean’s mixed surface layer. Water flow and turbulence facilitate nutrient assimilation across kelp fronds throughout the water column. Water clarity affects the depth to which sufficient light can be transmitted. In ideal conditions, giant kelp (Macrocystis spp.) can grow as much as 30–60 cm vertically per day. Some species, such as Nereocystis, are annuals, while others such as Eisenia are perennials, living for more than 20 years. In perennial kelp forests, maximum growth rates occur during upwelling months (typically spring and summer) and die-backs correspond to reduced nutrient availability, shorter photoperiods, and increased storm frequency. Kelps are primarily associated with temperate and arctic waters worldwide. Of the more dominant genera, Laminaria is mainly associated with both sides of the Atlantic Ocean and the coasts of China and Japan; Ecklonia is found in Australia, New Zealand, and South Africa; and Macrocystis occurs throughout the northeastern and southeastern Pacific Ocean, Southern Ocean archipelagos, and in patches around Australia, New Zealand, and South Africa. The region with the greatest diversity of kelps (>20 species) is the northeastern Pacific, from north of San Francisco, California, to the Aleutian Islands, Alaska. Although kelp forests are unknown in tropical surface waters, a few species of Laminaria have been known to occur exclusively in tropical deep waters. This general absence of kelp from the tropics is believed to be mostly due to insufficient nutrient levels associated with warm, oligotrophic waters. One recent study spatially overlaid the requisite physical parameters for kelp with mean oceanographic conditions has produced a model predicting the existence of subsurface kelps throughout the tropics worldwide to depths of 200 m. For a hotspot in the Galapagos Islands, the local model was improved with fine-scale data and tested; the research team found thriving kelp forests in all eight of their sampled sites, all of which had been predicted by the model, thus validated their approach. This suggests that their global model might actually be fairly accurate, and if so, kelp forests would be prolific in tropical subsurface waters worldwide. The importance of this contribution has been rapidly acknowledged within the scientific community and has prompted an entirely new trajectory of kelp forest research, particularly emphasizing the potential for a spatial refuge from climate change also the explanations to evolutionary patterns of kelps worldwide. Giant kelp uses gas-filled floats to keep the plant suspended, allowing the kelp blades near the ocean surface to capture light for photosynthesis. Canopy kelps include the largest species and often constitute floating canopies that extend to the ocean surface (e.g., Macrocystis and Alaria). Stipitate kelps generally extend a few meters above the sea floor and can grow in dense aggregations (e.g., Eisenia and Ecklonia). Prostrate kelps lie near and along the sea floor (e.g., Laminaria). The benthic assemblage is composed of other algal species (e.g., filamentous and foliose functional groups, articulated corallines) and sessile organisms along the ocean bottom. Multiple kelp species often co-exist within a forest; the term understory canopy refers to the stipitate and prostrate kelps. For example, a Macrocystis canopy may extend many meters above the seafloor towards the ocean surface, while an understory of the kelps Eisenia and Pterygophora reaches upward only a few meters. Beneath these kelps, a benthic assemblage of foliose red algae may occur. The dense vertical infrastructure with overlying canopy forms a system of microenvironments similar to those observed in a terrestrial forest, with a sunny canopy region, a partially shaded middle, and darkened seafloor. Each guild has associated organisms, which vary in their levels of dependence on the habitat, and the assemblage of these organisms can vary with kelp morphologies. For example, in California, Macrocystis pyrifera forests, the nudibranch Melibe leonina, and skeleton shrimp Caprella californica are closely associated with surface canopies; the kelp perch Brachyistius frenatus, rockfish Sebastes spp., and many other fishes are found within the stipitate understory; brittle stars and turban snails Tegula spp. are closely associated with the kelp holdfast, while various herbivores, such as sea urchins and abalone, live under the prostrate canopy; many seastars, hydroids, and benthic fishes live among the benthic assemblages; solitary corals, various gastropods, and echinoderms live over the encrusting coralline algae. In addition, pelagic fishes and marine mammals are loosely associated with kelp forests, usually interacting near the edges as they visit to feed on resident organisms. Classic studies in kelp forest ecology have largely focused on trophic interactions (the relationships between organisms and their food webs), particularly the understanding and top-down trophic processes. Bottom-up processes are generally driven by the abiotic conditions required for primary producers to grow, such as availability of light and nutrients, and the subsequent transfer of energy to consumers at higher trophic levels. For example, the occurrence of kelp is frequently correlated with oceanographic upwelling zones, which provide unusually high concentrations of nutrients to the local environment. This allows kelp to grow and subsequently support herbivores, which in turn support consumers at higher trophic levels. By contrast, in top-down processes, predators limit the biomass of species at lower trophic levels through consumption. In the absence of predation, these lower-level species flourish because resources that support their energetic requirements are not limiting. In a well-studied example from Alaskan kelp forests, sea otters (Enhydra lutris) control populations of herbivorous sea urchins through predation. When sea otters are removed from the ecosystem (for example, by human exploitation), urchin populations are released from predatory control and grow dramatically. This leads to increased herbivore pressure on local kelp stands. Deterioration of the kelp itself results in the loss of physical ecosystem structure and subsequently, the loss of other species associated with this habitat. In Alaskan kelp forest ecosystems, sea otters are the keystone species that mediates this trophic cascade. In Southern California, kelp forests persist without sea otters and the control of herbivorous urchins is instead mediated by a suite of predators including lobsters and large fishes, such as the California sheephead. The effect of removing one predatory species in this system differs from Alaska because redundancy exists in the trophic levels and other predatory species can continue to regulate urchins. However, the removal of multiple predators can effectively release urchins from predator pressure and allow the system to follow trajectories towards kelp forest degradation. Similar examples exist in Nova Scotia, South Africa, Australia and Chile. The relative importance of top-down versus bottom-up control in kelp forest ecosystems and the strengths of trophic interactions continue to be the subject of considerable scientific investigation. Though urchins are usually the dominant herbivores, others with significant interaction strengths include seastars, isopods, kelp crabs, and herbivorous fishes. In many cases, these organisms feed on kelp that has been dislodged from substrate and drifts near the ocean floor rather than expend energy searching for intact thalli on which to feed. When sufficient drift kelp is available, herbivorous grazers do not exert pressure on attached plants; when drift subsidies are unavailable, grazers directly impact the physical structure of the ecosystem. Many studies in Southern California have demonstrated that the availability of drift kelp specifically influences the foraging behavior of sea urchins. Drift kelp and kelp-derived particulate matter have also been important in subsidizing adjacent habitats, such as sandy beaches and the rocky intertidal. Catastrophic storms can remove surface kelp canopies through wave activity, but usually leave understory kelps intact; they can also remove urchins when little spatial refuge is available. Interspersed canopy clearings create a seascape mosaic where sunlight penetrates deeper into the kelp forest and species that are normally light-limited in the understory can flourish. Similarly, substrate cleared of kelp holdfasts can provide space for other sessile species to establish themselves and occupy the seafloor, sometimes directly competing with juvenile kelp and even inhibiting their settlement. Kelp forests have been important to human existence for thousands of years. Indeed, many now theorise that the first colonisation of the Americas was due to fishing communities following the Pacific kelp forests during the last ice age. One theory contends that the kelp forests that would have stretched from northeast Asia to the American Pacific coast would have provided many benefits to ancient boaters. The kelp forests would have provided many sustenance opportunities, as well as acting as a type of buffer from rough water. Besides these benefits, researchers believe that the kelp forests might have helped early boaters navigate, acting as a type of "kelp highway". Theorists also suggest that the kelp forests would have helped these ancient colonists by providing a stable way of life and preventing them from having to adapt to new ecosystems and develop new survival methods even as they traveled thousands of miles. Modern economies are based on fisheries of kelp-associated species such as lobster and rockfish. Humans can also harvest kelp directly to feed aquaculture species such as abalone and to extract the compound alginic acid, which is used in products like toothpaste and antacids. Kelp forests are valued for recreational activities such as SCUBA diving and kayaking; the industries that support these sports represent one benefit related to the ecosystem and the enjoyment derived from these activities represents another. All of these are examples of ecosystem services provided specifically by kelp forests. 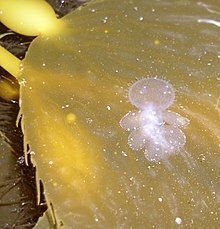 The nudibranch Melibe leonina on a Macrocystis frond (California): Marine protected areas are one way to guard kelp forests as an ecosystem. Given the complexity of kelp forests – their variable structure, geography, and interactions – they pose a considerable challenge to environmental managers. Extrapolating even well-studied trends to the future is difficult because interactions within the ecosystem will change under variable conditions, not all relationships in the ecosystem are understood, and the nonlinear thresholds to transitions are not yet recognized. With respect to kelp forests, major issues of concern include marine pollution and water quality, kelp harvesting and fisheries, invasive species, and climate change. The most pressing threat to kelp forest preservation may be the overfishing of coastal ecosystems, which by removing higher trophic levels facilitates their shift to depauperate urchin barrens. The maintenance of biodiversity is recognized as a way of generally stabilizing ecosystems and their services through mechanisms such as functional compensation and reduced susceptibility to foreign species invasions. In many places, managers have opted to regulate the harvest of kelp and/or the taking of kelp forest species by fisheries. While these may be effective in one sense, they do not necessarily protect the entirety of the ecosystem. Marine protected areas (MPAs) offer a unique solution that encompasses not only target species for harvesting, but also the interactions surrounding them and the local environment as a whole. Direct benefits of MPAs to fisheries (for example, spillover effects) have been well documented around the world. Indirect benefits have also been shown for several cases among species such as abalone and fishes in Central California. Most importantly, MPAs can be effective at protecting existing kelp forest ecosystems and may also allow for the regeneration of those that have been affected. Wikimedia Commons has media related to Kelp forests. "Kelp Forest & Rocky Subtidal Habitats". noaa.gov. "Kelp Watch". tas.gov.au. Tasmania, Australia: Department of Primary Industries, Water & Environment. Excellent general information on kelp forests, as well as specific information on Tasmanian kelp forests. "Monterey Bay Aquarium Kelp Cam". mbayaq.org. Monterey Bay Aquarium. Watch a live feed from the kelp forest exhibit.